We picked up the wrappers for our new flavors (Les Misérables and Treasure Island) from the printers this morning. This afternoon, we’ll be busy wrapping chocolate bars! We're thrilled to announce we have a new flavor coming soon. Our Les Misérables chocolate bar will be black cherry in dark chocolate. It will become available on our online store late March/early April. You can preorder it now here! Our Les Misérables chocolate bar is inspired by the character Fantine. In her youth, Fantine goes on an outing with her lover Tholomyès, her friends and their lovers. The four men and four women take a stroll through nature, enjoying the flowers and eating cherries. This outing soon turns sour when the four men “play a trick” on their mistresses and abandon them. Our chocolate bar contains the cherry of Fantine’s happy innocence and naiveté as well as the dark chocolate that represents her downfall. We are collaborating with River-Sea Chocolates, for our Les Misérables bar. They are a bean-to-bar chocolate maker who uses organic and ethically sourced ingredients. The chocolate bar will contain 70% dark chocolate originating from Vietnam. Just in time for the holidays! 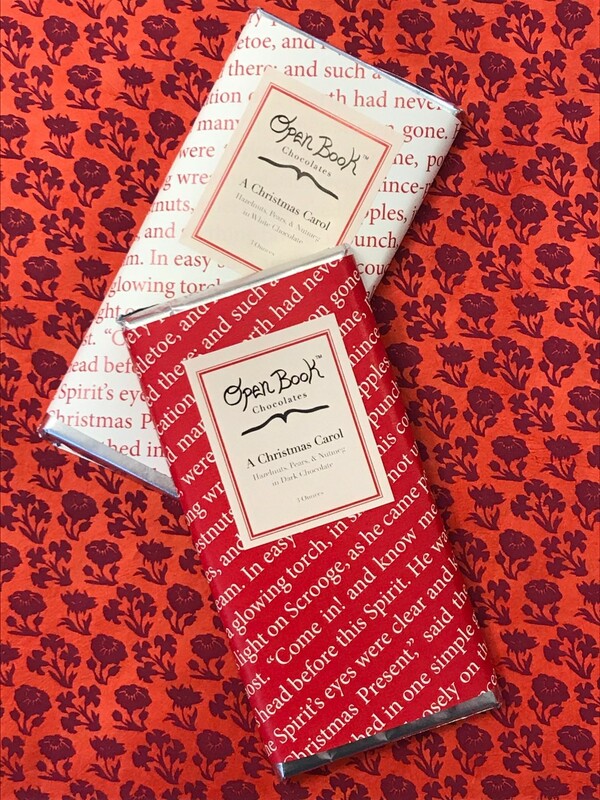 Our brand-new A Christmas Carol chocolate bars (hazelnuts, pears, and nutmeg in either dark or white chocolate) are now available for purchase: openbookchocolates.com/shop/a-christmas-carol-dark-chocolate and openbookchocolates.com/shop/a-christmas-carol. A Christmas Carol: Hazelnuts, Pears, & Nutmeg in White or Dark Chocolate! We're thrilled to announce we have a new flavor coming soon. Our Chirstmas Carol chocolate bar comes in either dark chocolate or white chocolate with hazelnuts, pears, and nutmeg. It will become available on our online store within the coming weeks. Just in time for the holidays! Janeites rejoice! Our brand-new Pride & Prejudice chocolate bars (blackcurrant tea and cinnamon in dark chocolate) are now available for purchase: openbookchocolates.com/shop/pride-prejudice. Pride & Prejudice: Blackcurrant Tea & Cinnamon in Dark Chocolate! We're thrilled to announce we have a new flavor coming soon. Our Pride & Prejudice chocolate bar contains dark chocolate, blackcurrant tea, and cinnamon. It will become available on our online store in the coming weeks. Janeites rejoice!